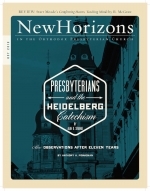 Why should Presbyterians—more particularly, Orthodox Presbyterians—care about the Heidelberg Catechism? We have two catechisms of our own that seem quite sufficient—if not to say, in the case of the Westminster Larger Catechism, challenging, even daunting at times. Why should we give a moment’s thought to the Heidelberg Catechism, particularly when we consider theologian B. B. Warfield’s assessment that, when compared to the Westminster Shorter Catechism, the Heidelberg Catechism is “too subjective”? In the early years of the Orthodox Presbyterian Church, a few Dutch-Americans with backgrounds in the Christian Reformed Church strongly (even excessively, some would say) shaped the Reformed identity of the young church. Among them were Westminster Seminary professors Ned Stonehouse, R. B. Kuiper, and Cornelius Van Til. Eleven years ago, in August 2002, my wife and I, along with our two small children, arrived in Charlottesville, Virginia. The purpose of our arrival was simple. I had been called by the Orthodox Presbyterian church in Staunton, Virginia, just across the Blue Ridge Mountains, to take up the labor of shepherding a church plant, Providence Orthodox Presbyterian Church, through its earliest years.